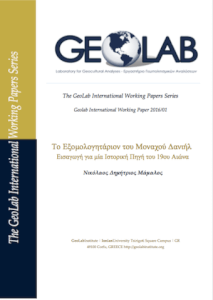 This research work is part of MOLCO Project of GeoLab. It was first published in the Volume “Authority and Sovereignty in Times of Crisis”, 2013, University of Calabria, Italy. A memorandum written in 1835 by Sinibaldo de Mas, the interpreter of the spanish diplomatic mission in Athens on the current situation and the perspectives of Greece.